Your perfect gift for all video gamers who want to play their games for real! Combat City Christmas Gift Vouchers Glasgow are available to purchase online at https://booking.bookinghound.com/scotkartgiftvouchers/vouchers.aspx on the phone by calling 0141 641 0222 or at reception. You can purchase a £20 voucher online for the full 90 minute ‘Tour of Duty’ run every Saturday afternoon at Combat City tactical laser tag in Cambuslang. 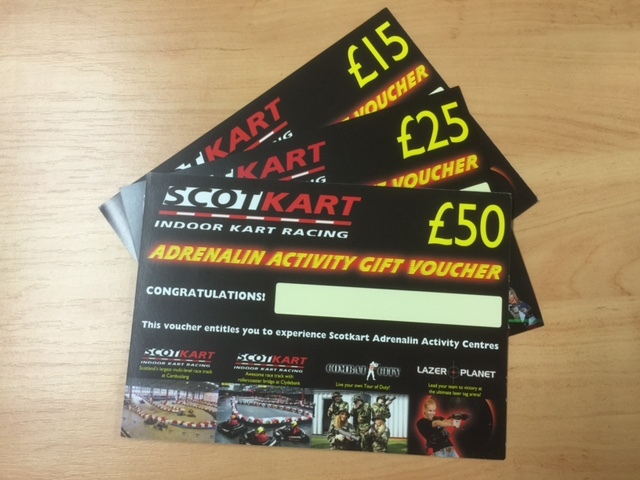 Alternately online and instore you can buy a ‘ScotKart Adrenalin Activity Voucher’ which entitles the holder to use the voucher for any of our activities – including indoor karting at ScotKart, Lazer Planet at Clydebank, and Combat City. The £20 voucher covers an all-inclusive session – the player arrives 30 minutes prior for registration, kit up and briefing (cammo suit and hat provided), followed by around 90 minutes in the arena, playing a selection of mission based games. There are no costly additional charges for ammo, unlike paintball. It’s a lot more exciting than a pair of socks or aftershave!